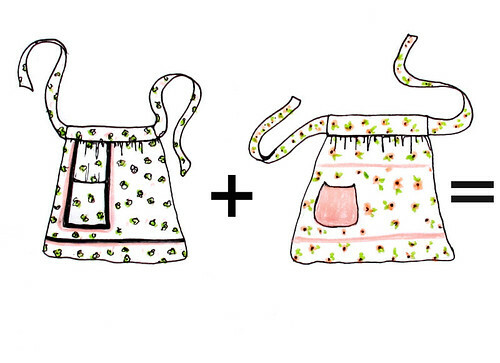 What do you get when you put together two vintage half aprons? A perfect little smock for stacking wood...or at the very least, a new blouse for layering in September's fickle weather. My mother came up with this idea a couple of weeks ago, when she was sorting through her stash of aprons. We bought an entire LOT of old 30's and 40's aprons at an auction years ago and have been coming up with ways to use them ever since. I love this new inspiration for two humble pieces that were completely ignored until they were merged as one. I'm much more likely to wear a tunic/smock/blouse then a half apron. I found that it added a little romance to the otherwise mundane task of stacking our winter firewood... a job that has been known to drag on for weeks. Not everyone has a collection vintage aprons, but they're quite easy to come by at any flea market or antique sale. And of course, you don't even have to leave your house: Etsy has pages upon pages of them right here. 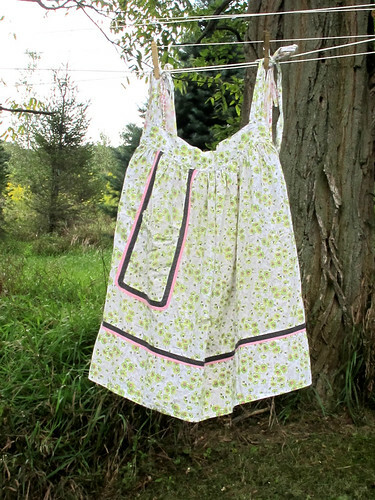 Find two half aprons that coordinate in size and color scheme. Lay right side to right side and sew up the sides, leaving several inches open for under the arm. Turn and fold up each of the waist ties to become a shoulder strap. Sew in place. Take in the waist band... (now turned neckline) with a tuck, gather or pleat if it's too wide. It takes 5 minutes to make and is reversible! Layer it or wear alone on a hot day... here's to hoping we have one last heat wave in the northeast! You have made my day with this! Thank you for this, and every other simple, smart and stunning idea that you share! how cute! Great art smock too (maybe for kids?). find some time this weekend. such a clever idea ! I LOVE this idea! thank you for sharing....now to find me some old aprons! how cute is this thats for sharing! This is brilliant!!! I have a vintage apron addiction - I buy them, but do I wear them...?! SO making some of these!!! Brilliant and so sweet! What a great way to use your collection! So cute! You are so creative with your ideas. I love the feminine wood stacker look. So glad you loved the idea, too. You seem to enjoy a quick and satisfying project just as much as I do. Oh, I really like this idea. I enjoy wearing full aprons but not half aprons. Great solution. Another smart Maya-idea. I love it! 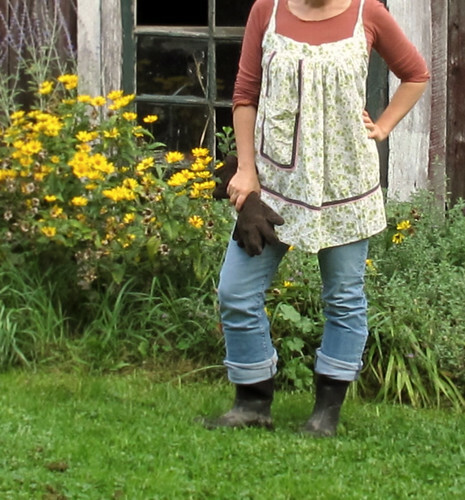 I too might be making some half aprons especially for this blouse as we are coming up to spring and a hot summer. 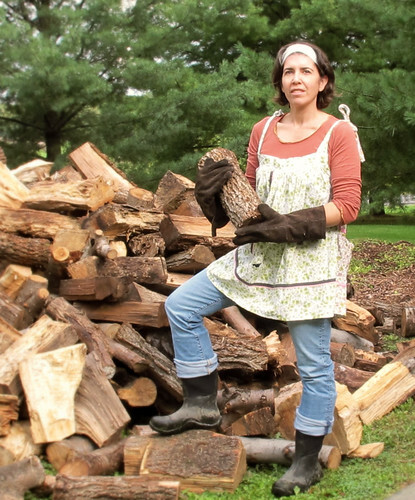 I just piled up my wood yesterday and could have used the smock. I have been looking for one and now you have answered where and how to make one. I need a smock because I am always messing up my tops and blouses I wear. I was born in Germany and every women would put on a smock the first thing when they are in the kitten and cleaning. Too cute and great idea! I'll have to keep this in mind and hunt for aprons in my local thrift store now! What a great idea! I'm jealous of your stash, though! I love vintage aprons. this is genius maya. i am going to make a few of these to wear and layer. love the way it looks. This is so cute! Funny, though, I just did exactly the opposite... I turned a cute, but not so nice-fitting smock into a half apron using almost exactly the same steps in reverse! So totally Cute!!! And so easy. 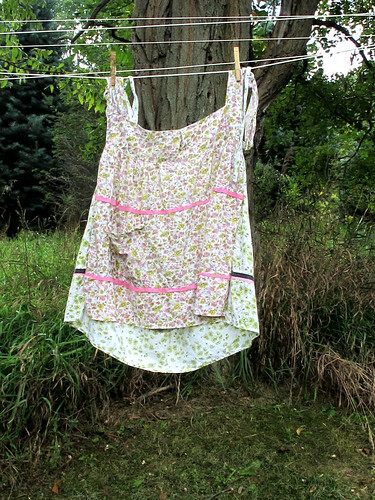 I have all of my half aprons hanging on a clothes line running up the staircase to my studio. I will have to try this. Thanks so much for the inspiration. Excellent idea. I find I don't wear half aprons either...but, I would wear something like this. This is just adorable! I love it! thanks so much! Brilliant! Thanks for the idea...think I'll take it and run with it!